Fibromyalgia (FM) is a syndrome characterized by widespread chronic pain associated to other symptoms, such as: fatigue, anxiety, depression and sleep disorders. Health education programs (HEP) have emerged as good non-pharmacological strategies to treat it. However, it is still not clear if the benefits are only subjective, or it has also objective impacts on immune and or neuroendocrine systems. Fifty-eight fibromyalgia women were randomly allocated in experimental group (n = 27) or control group (n = 31). The experimental group was submitted to HEP treatment for 11 weeks, while control group did not receive intervention at the same period. All data were collected at zero and 11th week by a blinded researcher. The statistical analysis were made in GraphPad Prism software (version 5.0) with significant level adjusted for α = 0.05. Forty-four patients concluded the full study, 21 in the experimental group and 23 in the control group. Intragroup and intergroup analysis revealed that treatment induced significant increases of IL-4 plasma levels, anti-inflammatory cytokine/inflammatory cytokine ratio (AC/IC ratio), salivary cortisol levels, in addition to significant decreases on FIQ scores. Intergroup variation analyses revealed also significant increases of IL-10 plasma levels. The results presented suggest that this kind of HEP could induce subjective and objective changes (immune and neuroendocrine), that could explain, at least in part the improvement of fibromyalgia patient’s health status. (Clinical Trial Registration Number - ReBEC - RBR-5tdnbr). Fibromyalgia (FM) is a syndrome characterized by chronic widespread pain associated to others symptoms such as fatigue, anxiety, depression and sleep disturbances . Some studies have provided evidence of the neuroendocrine and immune systems involvement in FM, [2–5] but its pathophysiology remain unclear despite all studies in the area . FM has been considered a clinical condition derived from disturbances in the stress system, with abnormalities in the hypothalamic-pituitary-adrenal (HPA) axis and in the serotoninergic system [3, 7, 8]. Patients bearing this syndrome present significant abnormalities in the levels of some hormones such as melatonin  and cortisol,  and of inflammatory cytokines . For the treatment of this chronic condition, a range of pharmacological and non-pharmacological treatments have been used, however, its multifactorial etiology, associated with patients’ clinical heterogeneity has turned out extremely difficult to establish efficient therapeutic practices . Regarding the non-pharmacological treatments, health education programs (HEP) have been successfully adopted in some cases. They can induce healthy habits, coping strategies and empowerment, and their benefits have been demonstrated through clinical progress evaluations, that consider subjective variables such as pain level, fatigue, sleep quality, anxiety and depression [9–11]. In the current study we aimed to evaluate if HEP could impact on objective immune and neuroendocrine parameters, besides subjective variables. For this purpose, after 11 week of intervention, we evaluated plasma levels of cytokines: IL-2, IL-4, IL-6, IL-10, TNF, and IL-17A, salivary cortisol levels, and general health status of FM patients evaluated through the self-administered Fibromyalgia Impact Questionnaire (FIQ). The research protocol was approved by Human Research Committee of XXXXX and by the XXXXX (protocol numbers: 0224.0.203.000–10 and 141/2010). All participants were volunteers and provided written informed consent before inclusion in this study. Based on previous studies that has used the similar intervention  and outcomes2,12,13 which included sample sizes varying between 15 and 30 participants per group, it was estimate a minimum of 21 participants for each group. In order to verify the statistical power of the results achieved with that sample size, a posteriori calculation was performed, using the G*Power software (Version 3.1.9.2),  considering a 0.05 significance level (α = 0.05) and a power of 80% (β = 0.20). The variable AC/IC ratio values were used for calculation. Patient recruitment was done through advertisements in local radio, print newspapers and posters displayed in health facilities of Formiga, Minas Gerais, Brasil. All potential patients were submitted to clinical evaluation for the research physician to confirm the FM diagnosis according to the 1990’s American College of Rheumatology (ACR) criteria . The new diagnosis criteria  was not used because they were published after submission of the research project to the Ethics Committee. It was included every women with: confirmed FM diagnosis, those aged between 18 and 60 years old, fluent in Portuguese and who that gave written informed consent. It was excluded every woman that: were not literate, have not confirmed the FM diagnosis, those aged under 18 and over 60 years old, who had past or present of chronic inflammatory disease (such as spondyloarthritis and ankylosing spondylitis) or autoimmune diseases (such as systemic lupus erythematosus or rheumatoid arthritis), who had past or present of psychiatric diseases (such as major depression, schizophrenia, bipolar disorder), who presented acute infectious disease at the time of data collect, who had used anti-allergic, antibiotics or anti-inflammatory drugs in the last three months, those who got pregnant or breast-feeding and those who had no pharmacological stability for a period of at least three months before the beginning of the intervention or who changed medicines during the intervention period [4, 5]. No man was selected for the study because fibromyalgia affects up to nine women for each affected man,  in addition the inclusion of men in a sample composed mostly of women could generate interpretation bias. It is a randomized clinical trial with parallel group approved by Brazilian Register of Clinical Trials ReBEC-RBR-5tdnbr (full protocol available in http://www.ensaiosclinicos.gov.br/rg/RBR-5tdnbr/). Seventy-five women were enrolled to the study, but only fifty-eight had confirmed FM diagnosis. Those 58 women were randomly allocated by envelope at experimental or control group. The experimental group was submitted to treatment by Inter-relational School of fibromyalgia, while the control group did not receive intervention at the same period. Both groups had collected blood and saliva samples and filled the FIQ questionnaire at zero and 11th week. All data were collected by a blinded researcher regarding the study objectives and groups (Fig. 1). The experimental group was submitted to the HEP based on the “Inter-relational School of Fibromyalgia (ISF),  with some modifications. The intervention started in June 2012. The description of the activities is shown at Table 1. The original ISF use predominantly vertical lectures, but we opted for more patient-oriented and interactive approaches. In each meeting day, the monitors briefly presented the general issue to be addressed, and soon after started up a casual conversation that was based on personal questions raised by the attendees. The duration of the intervention was eleven weeks with a face-to-face meeting once a week and a pause of fifteen days between the sixth and seventh week. This pause was considering important to allow the incorporation of the activities to the daily routine of the participants . Each meeting had two health professionals whose formation varied according to the discussed topic . The duration of the intervention, the number of meetings, the break and the topics covered in each meeting were based on the original study by Souza et al. . Briefly introducing the nine steps of the program and negotiate the therapeutic contract. This contract has an objective to modulate the expectations of patients and consists of: a) define three realistic and measurable personal objectives; b) determine the lowest percentage of improvement in the clinical picture, acceptable (between 5 and 20%). According to the contract, participants also agree to devote 45 min/day, 6 days/week to practice the activities prescribed by the ISF such as relaxation techniques, diaphragmatic breathing, stretching, strengthening and aerobic exercise. Promoting experimentation of sensory organs. Discuss the ways in which people feel and perceive the world and the reality around them. Demonstrating deep diaphragmatic breathing. Demonstrating that the environment perceptions are related to previous experience and so then perception of pain, as well as other symptoms may also be influenced by prior experience. Demonstrate some techniques of mental preparation and coping strategies to deal with the pain. Practice yoga class with emphasis on meditation. The participant will choose a relaxation technique and practice it 3 times a week for 15 to 20 min. Discussing the effects of a sedentary lifestyle and physical activity. Demonstrate warm-up, stretching, strengthening and aerobic exercises. Perform calculations to identify heart rate (HR) max. Practice session of Pilates on the ground. Prescribe an exercise program to be held at home: a) exercise routine: 6 times/week, 15 min, with stretching and strengthening; b) walk, moderate 40 to 60% HR max; 3 times/week; 30 min. Studying the mechanisms involved in pain, fatigue, muscle stiffness, in sleep disorders, anxiety and depression. Discussing the basic components of a healthy balanced diet, the benefits of hydration and the dangers provided by foods rich in sugars, fats and or sodium. 2 weeks of self-employment: integration of strategies individually (without meeting with therapists). Discussing the influence of chronic pain on the emotional, interpersonal relationships, daily activities and sexuality. Discuss aspects related to suicidal thoughts. Presenting and discuss scientific evidence based on the main types of pharmacological and non-pharmacological treatments currently used to treat fibromyalgia. Motivate patients to continue the prescribed activities. Presenting a retrospective of the issues addressed. During the first eleven weeks, the control group was not submitted to any intervention. Patients were kept in hold and they submitted to the HEP treatment only after the completion of the research. A trained professional unknowing the study objectives and groups performed all data collection. All data of interest were collected in both groups at the same time and in two moments: a) baseline – before intervention b) after eleven weeks of intervention (Fig. 1). Blood sample was collected in the morning using tubes coated with ethylenediamine tetraacetic acid (EDTA) as the anticoagulant and it was immediately centrifuged for 10 min, at 4 °C and 2000 rpm and the plasma was collected and stored at -80 °C. To measure the cytokine levels it was used the BD™ Cytometric Bead Array kit (CBA) TH1/TH2/TH17 according to the manufactory instructions (BD Bioscience, San Jose, CA, USA). The flow cytometer data acquisition was performed using the FACSCalibur (BD Bioscience, San Jose, CA, USA) and the data analyses were done by BD CellQuest Software (BD Bioscience, San Jose, CA, USA). The cytokines levels were calculated by FlowJo 7.6.1 Software (Tree StarTM, Inc., Ashland, OR) and were expressed as pg/ml. The AC/IC ratio was calculated by sum of anti-inflammatory cytokines (IL-4 + IL-10) and the resulted was divided by the sum of inflammatory cytokines (IL-2 + IL-6 + TNF + IL-17A). Salivary cortisol levels were used as an objective marker of HPA axis activity. Saliva samples from patients of experimental and control group were collected using cotton rolls at 8 a.m. at the day before blood sample collected. Subjects were instructed not to intake food nor brush their teeth 30 min before sample collection to avoid contamination of saliva samples, and to store saliva samples at their freezers until completing the experimental protocol and then return the samples to the laboratory. Samples were centrifuged and frozen at –20 °C until the analysis. Free cortisol in saliva was determined using a time-resolved immunoassay according manufactory instructions (DSL-10 67,100 Diagnostic Systems Laboratories, Webster, TX, USA). The sensitivity of this test was 0.071 ng/ml. The intra- and inter-assay coefficients of variation were 5.4 and 9.3% respectively. It is a self-administered questionnaire designed specifically to analyses the current health status of FM patients . It is compound by 19 questions that evaluated the physical functioning, work status (missed days of work and job difficulty) depression, anxiety, morning tiredness, pain, stiffness, fatigue and well-being over the past week. The questions are scored from 0 to 10 wherein the final score could vary from 0 to 100. Higher scores are related to more severe impact in the quality of life . The Brazilian version of the FIQ was used . The management of the database and statistical analyzes were performed by an independent researcher, blinded regarding the groups. Professionals responsible for intervention carried out the adherence to the treatment. Descriptive statistics were performed for all outcome measures. 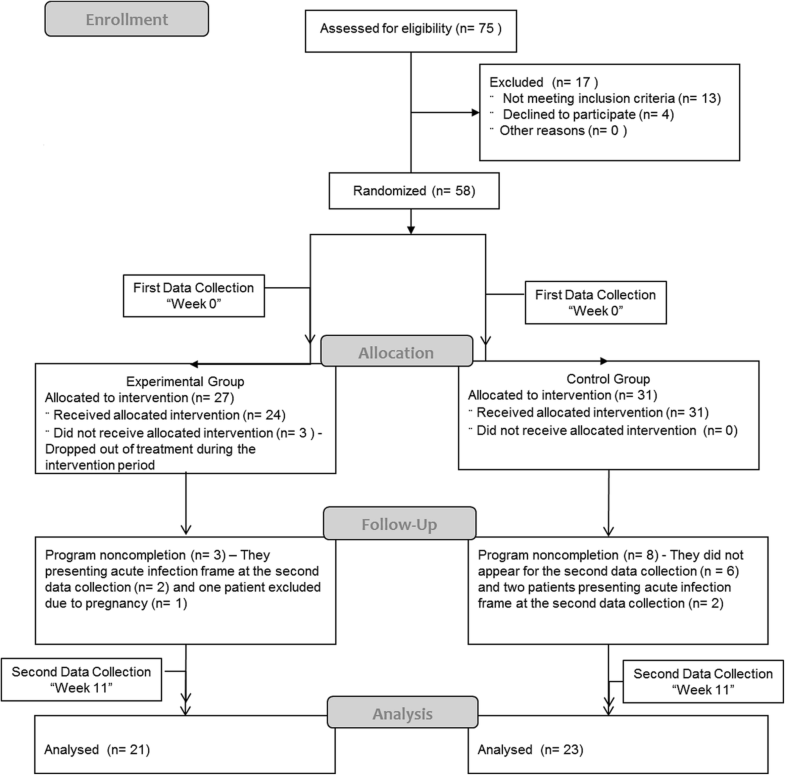 The effect of the intervention was analyzed considering only the patients who started and completed the study. The Kolmogorov-Smirnov (with Dallal-Wilkinson Lilliefor p-value) was used to evaluate the distribution of the data. Paired t test was used for comparison between pretreatment and post treatment in both groups. Student’s T test or Mann-Whitney test was used to investigate intergroup results. The post treatment data in the experimental group were also used to perform a linear regression test using the AC/IC as dependent variable. All data were analyzed with GraphPad Prism software (version 5.0) with significance set at 5% level (α = 0.05). The results were presented as mean ± standard deviation, and intra-group and inter-group differences were also presented as mean ± standard deviation and 95% confidence interval (95% CI). Fifth-eight patients were initially enrolled in the study, and forty-four remained until the end o of the research. In the experimental group, three women dropped out during the intervention period (two women claimed they did not have time to participate in activities due to domestic chores and one claimed that she needed to discontinue treatment to travel with her family). Moreover, three patients were excluded close to the end, two of them because of the change in pharmacological treatment, and one because of pregnancy. In the control group, six women dropped out (three of them gave up because of the waiting time, two changed their mind and one moved out). In this group, two patients were excluded because they changed pharmacological treatment (Fig. 1). The mean age of the 44 women that concluded the study was 49.77 ± 11.13 years old and the body mass index (BMI) was 26.65 ± 4.70 kg/m2. The mean time of diagnosis was 6.14 ± 5.55 years and mean tender point count was 16.28 ± 1.76. There were no statistical differences between groups considering age, BMI, time of diagnosis and tender point count (Table 2). Table 3 demonstrates that there was not significant difference between groups at the beginning of the study considering the following variables: serum levels of IL-2, IL-4, IL-6, IL-10, TNF, IL-17A, AC/IC ratio, salivary cortisol levels, and FIQ score. For intragroup analysis, differences between baseline data and 11th week data were calculated. The group that was submitted to intervention presented increasing of the following parameters analyzed: IL-4 plasma levels (MD = 0.76; 95%CI = 0.14 to 1.39; p = 0.02), AC/IC ratio (MD = 0.07; 95%CI = 0.01 to 0.13; p = 0.02), and salivary cortisol levels (MD = 0.98; 95%CI = 0.18 to 1.78; p = 0,02) and significant reduced in the mean FIQ score (MD = − 30.36; 95%CI = − 39.16 to − 21.56, p < 0.01). The other data did not evidence any significant difference during the study period (Fig. 2). The analysis of difference in the baseline data and at the end of the study in the control group did not show significant differences (Fig. 3). To evaluate the intergroup analysis, it was calculated the difference between the value of each variable at the 11th week and week zero to every participant to determine the individual variation and followed the means variation of each data. 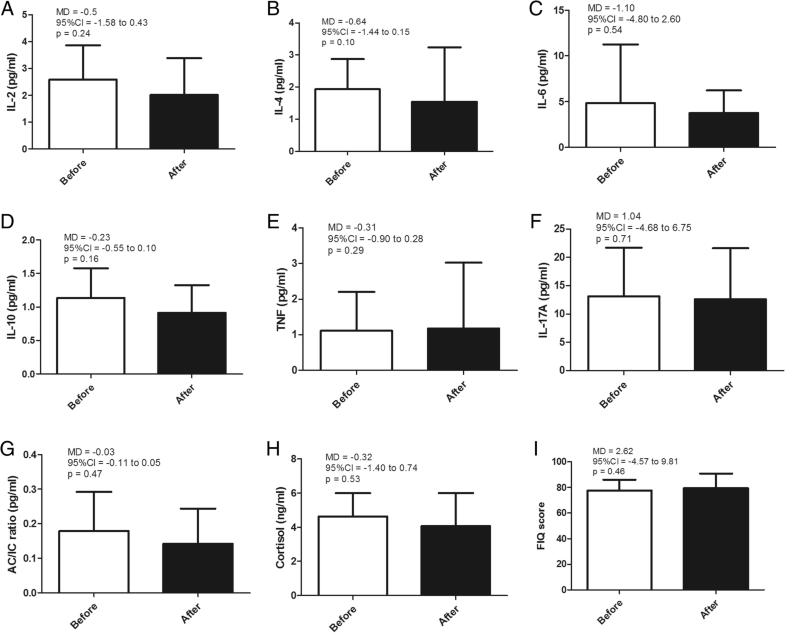 This analysis showed that FM patients from experimental group had significant increased plasma levels of IL-4 (MD = 1.48; 95%CI = 0.40 to 2.56; p < 0,01) and IL-10 (MD = 0.39; 95%CI = 0.01 to 0.76; p = 0,04), such as significant increase in AC/IC ratio (MD = 0.10; 95%CI = 0.01 to 0.19; p = 0,03) and in the salivary cortisol levels (MD = 1.35; 95%CI = 0.11 to 2.60; p = 0,03), in the other hand, it was noticed significant reduced in mean FIQ score (MD = − 31.42; 95%CI = − 42.96 to − 19.88; p < 0.01). No other data presented any significant difference between groups (Table 4). The regression analysis in the experimental group showed that IL-4 levels at the end of the study explained 51% of the variance on AC/IC ratio (β = 0.06; 95%CI 0.01 to 0.11; p = 0.02). One of the hypotheses that try to explain the pathophysiology of FM is the central sensitization of pain transmission pathways with concomitant increase of neurotransmitters and inflammatory cytokines in the cerebrospinal fluid . Such changes appear to be related to HPA axis dysfunctions, such as decreased release of cortisol, which in turn may influence the metabolic and immune activity of the individual . We believe that the hypocortisolism presented by fibromyalgia patients is responsible for an inflammatory state with increased of inflammatory cytokines [2, 3, 17, 18] that could affected the nociceptors [19, 20]. In this study, we chose to use an RCT for the study of biomarkers in FM patients because most of the research using non-pharmacological treatments for FM uses only subjective variables collected through questionnaires and or interviews [10, 21]. However, here we would like to know if the subjective changes presented by such studies are accompanied by objective changes in biomarkers of immune and neuroendocrine activity. The biomarkers used in this study were selected because they are frequently described as altered in patients with FM [2, 3, 17, 18]. In this sense, the HEP adopted in this study was able to promote reducing of FIQ scores, and, interestingly, it also induces objective changes revealed by changes in salivary cortisol levels, plasma cytokine levels (IL-4 and IL-10) and AC/IC ratio. Both cytokines, IL-4 and IL-10, are very important in the modulation of immune response . IL-4 induces the phosphorylation of the transcription factor STAT6, and thus inhibits the production of some inflammatory cytokines and chemokines such as IL-1β, IL-6, IL-8 and TNF- α by macrophages and monocytes [22, 23]. 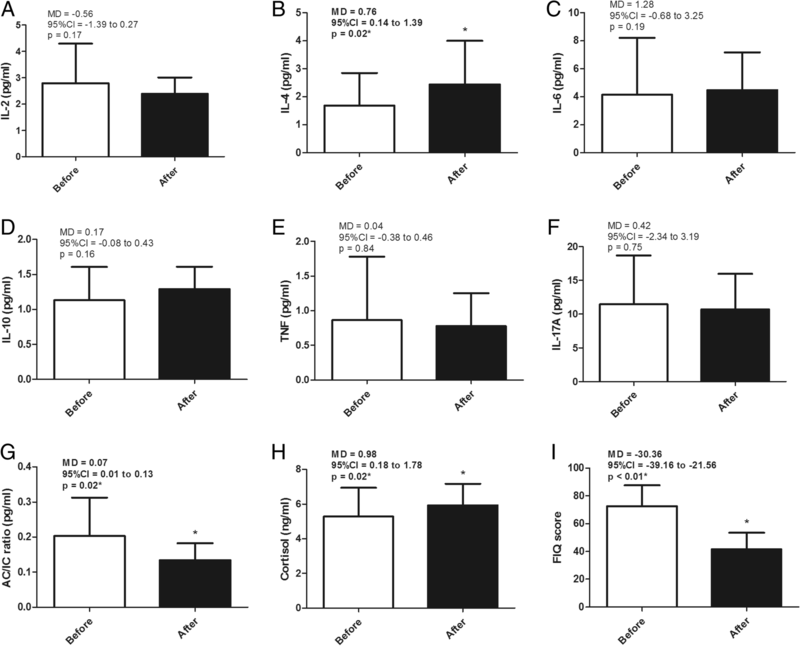 IL-10 has been considered one of the most powerful anti-inflammatory cytokines, since it blocks NFkB pathway and module JAK-STAT pathway decreasing the synthesis of IL-1, IL-6, TNF and IFNγ by macrophages and Th1 cells [24, 25]. In FM patients, decreased levels of IL- 4 and IL-10 have been described [2, 26]. In this context, the observed HEP induced increasing in both, IL-4 and IL-10 levels, point to the success of such intervention, by inducing a more modulatory immune response. Indeed, IL-4 and IL-10 have been tested in therapeutic interventions in some autoimmune diseases such as psoriasis and rheumatoid arthritis with satisfactory results [27–29]. It is also important to mention that if the inflammatory changes observed in FM are really associated with dysregulation of the HPA axis,  it is likely that other health conditions related to psychoemotional stress may benefit from this type of intervention [30–32]. To confirm this hypothesis, further studies should be conducted. Another important finding in this study was the increased AC/IC ratio presented by HEP treated group that was mainly influenced by the increased levels of IL-4. According to the literature, the imbalance between anti-inflammatory and inflammatory cytokines is one of the responsible for the occurrence and perpetuation of FM symptoms [2, 4, 33–35]. Low levels of IL − 4 and IL-10 have been related to depressive behavior and pain (IL-4),  chronic fatigue (IL-10)  and hyperalgesia (IL-10) . In the current study, HEP induced increased levels of IL-4 and IL-10 associated with decreased in FIQ score, which in turn is an indicative of an improved clinical status and quality of life [14, 15]. It is likely that the reduction in FIQ scores is related, at least in part, to the Hawthorne effect. This effect, known as the expectation effect of the individual, consists of positive changes in the behavior of subjects or groups simply because they are receiving attention or interest from others [37, 38]. However, some strategies used in HEP, such as stress management activities and physical activities are able to ameliorate the inflammatory process and improve the health [39–41]. The HEP treatment also induced an enhanced in the salivary morning cortisol levels, which is a clinically important finding. Hypocortisolism in FM, mainly in the morning, has been demonstrated by some studies, [3, 42] and it has been considered to be responsible in part by the claimed pain, fatigue and depression by FM patients [17, 43]. It is important to note that the hypocortisolism presented by FM patients are related to HPA axis dysfunction, also named stress response axis . According to this theory, individuals expose to stress agents (physical or psychoemotional) for long periods could experience a phenomenon called burnout syndrome, characterized by lower cortisol production in response to stress agent . We believe that the increasing of cortisol levels in the experimental group could indicate that the coping strategies taught in the ISF contributed in a positive way to these patients, helping them to live or face more adequately the different types of adversity. In this study, 78% of those enrolled to treatment remained until the end of the 11th week (the researchers excluded 11% and the other 11% dropped out the study). If we consider only the participants who voluntarily withdrew from the study, the adherence to treatment was 89%. It has been considered that adhesion to treatment is one of the main negative points in the HEP [10, 21]. In this study the HEP adherence level could be considered satisfactory, and we think that it could be explained mainly by the use of a patient-centered methodology, instead of using traditional models of HEP, with hierarchical relationships. Finally, the results from the present study, in conjunction with data from the literature, reinforces the hypothesis that HEP might satisfactorily contribute to FM patients treatment. After all, in this group of FM patients, the HEP like ISF, not only promoted the subjective perception of improvement in the FM patients, but, above all, they were able to promote objective changes in biomarkers of neuroendocrine and immunological activity. Because of the sample size and clinical variability presented by people with FM,  it is not possible to state that this type of intervention will promote the same benefits for all other FM patients. Thus, the use of HEP for FM should be a choice of the health professional in agreement with the patient. We encourage further studies with larger sample size and that seek to analyze other important biomarkers for fibromyalgia. The HEP like ISF program significantly improved the health status of the participants underwent intervention. This was evidenced by increased plasma levels of IL-4 and IL-10, increase AC/ IC ratio, and the salivary cortisol levels of the participants underwent the intervention in addition to reduced FIQ score. Despite the limited sample size, we recommend the use of HEP like ISF to treat FM patients and we expect that this study may serve as a starting point for further investigations to clarify issues that were not addressed here. We thank the Fundação de Amparo à Pesquisa do Estado de Minas Gerais (FAPEMIG) for the financial support of the Fundação Oswaldo Cruz Foundation (FIOCRUZ) – Instituto René Rachou for laboratory analysis and the Centro Universitário de Formiga - MG (UNIFOR-MG) for logistical support to the project. The Fundação de Amparo à Pesquisa do Estado de Minas Gerais (FAPEMIG) financed the PhD scholarship of the APP researcher and the purchase of the reagents for laboratory analysis. The funding agency did not participate in the project’s elaboration and did not participate in any stage of project execution or writing of the manuscript. We declare that this research protocol was submitted to the Ethic Committee of Universidade Federal de Minas Gerais and to the Ethic Committee of Centro Universitário de Formiga and that the protocol was approved by both committees according to their respective decisions: ETIC n° 0224.0.203.00–10 and N° 141/210. We also stated that all participants in the research signed a two-way informed consent form. These and other procedures were based on CNS Resolution 196/96 and the Helsinki Declaration. Finally, we declare that this randomized clinical trial was protocolized and approved in the Brazilian Registry of Clinical Trials and received the Clinical Trial Registration Number (ReBEC - RBR- 5tdnbr). APP - Planning of the research project, submission to the Ethics Committee, recruitment of participants, initial data collection, intervention, final data collection, laboratory analysis, tabulation of results, article writing, submission to Advances in Rheumatology. LSCC – Co advisor, planning of the research project initial data collection, intervention, final data collection, laboratory analysis, article writing. LPLS - Initial data collection, intervention, final data collection, laboratory analysis, article writing. JCP - Statistical analyzes, article writing. RSV - Selection of participants, confirmation of the diagnosis of fibromyalgia, screening for inclusion and exclusion criteria. DAR – Advisor, planning of the research project, intervention, laboratory analysis, article writing. * All authors read and approved the final manuscript. All authors declare that there is no conflict of interest related to this article. We declare that there is no competing interest related to this manuscript, be it financial or otherwise.